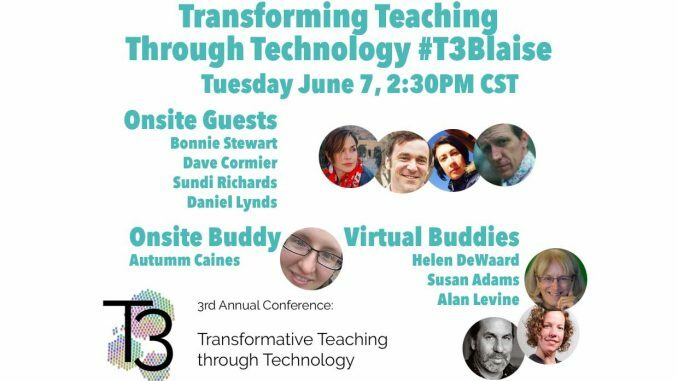 Virtually Connecting will be present Tuesday June 7 and part of the 3rd annual Transforming Teaching through Technology (T3) Conference at St Norbert College in De Pere, Wisconsin. Transformative Teaching Through Technology (T3) is a one day conference at St Norbert College focused on engaging trends in education. A professional development opportunity led by faculty, librarians, and staff, participants will share approaches to enhancing digital literacies in their practice. Onsite buddy Autumm Caines will connect us along with virtual buddy Helen DeWaard to keynote speakers Bon Stewart and Dave Cormier plus conference organizers Sundi Richards and Daniel Lynds. Virtual buddies include host Helen DeWaard, Susan Adams, and Alan Levine plus virtual participants Stephanie Loomis, Britni Brown, Suzanne Marilley, Apostolos Koutropoulos, and Rebecca Hogue. A related conference session earlier in the day Networking Through Conversation: Using Community to Overcome Barriers to Connection features Virtual Connectors Maha Bali, Autumm Caines, Rebecca Hogue, and Lisa Hammerschaimb. Event hashtags for this conference are #T3BLAISE & #DIGPINS – tweet, watch, and virtually connect with us! We have open seats to participate in the live hangout, just send a tweet of interest to @VConnecting or leave a comment on this post along with your twitter handle so we can send you the participant link.